As workloads move to the cloud, it’s only natural that new and existing Riverbed customers ask ‘hey, can you optimize traffic for Azure like you do for our WAN?’ And the answer is an enthusiastic ‘yes’. You can optimize Azure workloads using the SteelHead CX as detailed in this Solution Guide. 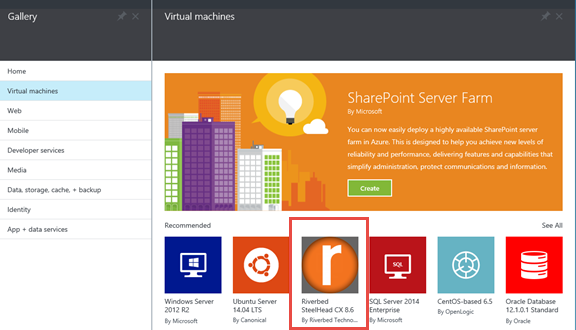 Certainly, you can manually deploy the SteelHead CX to Azure but since Riverbed works very closely with Microsoft , we have integrated the deployment of the SteelHead CX with the Azure Gallery. Just click through the deployment wizard and you’ll have your SteelHead CX running within a few minutes. There are few important additional steps required to setup optimization. Step-by-step instructions are provided in the Optimizing Azure Workloads with the SteelHead CX Solution Guide. Once configured, you’ll see the same excellent bandwidth reduction and application acceleration customers have come to expect from Riverbed WAN optimization, but applied to Azure traffic. Once in place, you can optimize traffic to and from Azure hosted services such as SharePoint servers, websites, and transferring content in and out of Azure storage. We are actively working with Microsoft to publish a paper on optimizing Microsoft’s Azure Site Recovery service which uses Hyper-V Replication services in Windows Server 2012 R2 along with System Center Hyper-VM Manager to replicate virtual machines to Azure. As vhdx (virtual machines disk files) can be very large, SteelHead technology is natural fit to reduce the significant bandwidth loads that accompany copying 100s of Gigabytes to Azure, and keeping the disk images current with periodic refreshes. Preliminary results are very, very good (along the lines of previous studies on Hyper-V replication optimization). As you can imagine, we are super-psyched to be included in the Azure Gallery and bring this technology to the world of Azure customers. Want more? See this video for a brief overview.